Passengers travelling eastwards from Budapest’s Liszt Ferenc Airport have an opportunity to see Mumbai’s new Chhatrapati Shivaji International Airport, now surely one of the world’s most beautiful and astonishing airports. Turkish Airlines, Qatar Airways, KLM, Lufthansa and British Airways all touch down in Budapest and Mumbai, where then-Indian prime minister Manmohan Singh inaugurated the state-of-the-art Terminal 2, or T2, on 10 January this year. It opened for international operations on 12 February. 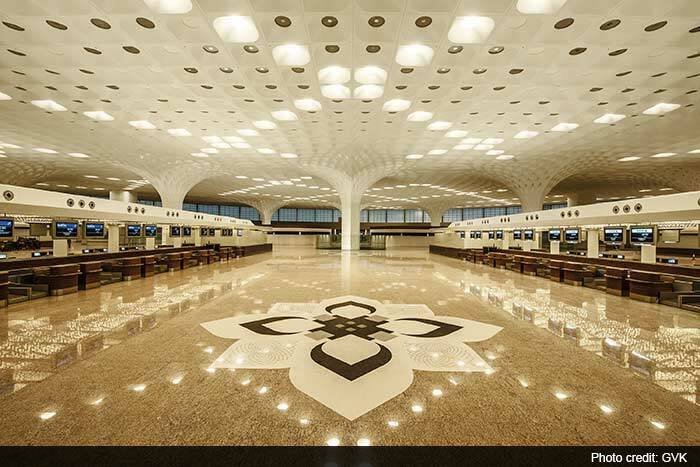 The decision to rebuild Mumbai’s dingy and congested Chhatrapati Shivaji International Airport was taken in 2006 and the new terminal was built by the GVK-led consortium at a cost of over Rp 12,500 crores (a crore is 10 million in India). GVK is a leading Indian conglomerate with a presence across energy, resources, airports, transportation, hospitality and life sciences sectors. The airport is named after a 17th-century Maratha emperor but almost everything else about it is strictly 21st century. A very constrained airport, Chhatrapati Shivaji severely lacks land and it was a daunting task to rebuild while ensuring minimal interference with passengers. The complex four-level project created its own benchmarks. Ambitious and grand, it is an architectural feat in its own right. For one, the pillars utilised revolutionary engineering so that they could be spread further apart than normal, creating an air of spaciousness. 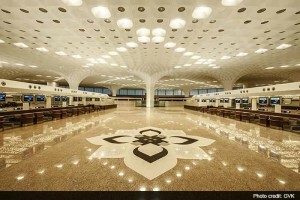 The terminal takes its design inspiration from the feathers of the majestic peacock, India’s national bird, and the lotus, the national flower. The result is awe-inspiring, and that is even if you don’t consider the Jaya He art exhibit, said to be the world’s largest public art programme located in an airport, with 6,000 pieces of Indian art from all over the country. The majority originates from the 8th to the 19th centuries, with some 100 commissioned contemporary works, including by renowned Indian artists. The exhibits are displayed on 5.5-metre-high walls along the terminal’s corridors, moving walkways and other standalone display areas totalling 1.2 kilometres and encompassing 7,430 square metres. It has been referred to by the BBC as “India’s largest museum”. Metal and glasswork workers, mud-wall painters, soundscapers, sculptors, wood carvers, terracotta modellers and other artists used conventional materials plus recycled metal, waste including bottle tops and scrapped electrical circuits, glazed tiles, water features and moving items. These sit along with the conserved and restored traditional artefacts, such as totem poles from Nagaland, doors from Sikkim, metal lamps from Kerala, chariots and stone pillars, often hundreds of years old. 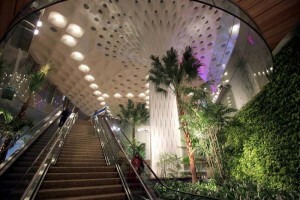 With an expected 40 million passengers annually, far more people passing through “BOM” –to use the airport’s IATA airport code derived from Bombay, Mumbai’s former name – will see the art extravaganza than visit the Louvre in Paris each year. Chhatrapati Shivaji is India’s second-busiest airport, after Delhi’s Indira Gandhi International. T2 is connected to the domestic Sahar airport by a six-lane elevated expressway, also built by the GVK consortium. A multi-level car park accommodates 5,000 vehicles. There are 21,000 square metres for retail shopping. A worthwhile option for those with a long stopover is the Pranaam GVK Guest Service. This offers a warm welcome by a uniformed attendant at the departure or arrival gates and, if needed, a chaufeurred drive by luxury car between terminals. Pranaam offers personalised assistance through all the airline and airport processes, such as immigration, passport control, check-in and guidance to the boarding gate. VIP lanes are used. A dedicated porter will look after the luggage and a buggy will take you around the airport. The meet-and-assist service includes use of Pranaam’s sumptuous lounge with comfortable seating, a buffet with complimentary food and drinks, kids’ corner and baby-care room, and business section with free wi-fi.